"We’re able to see that the mindset of faith and perseverance, just like the balls and brains we put into keeping the band together, actually worked"
NOTHING MORE is a band that took its name from the concept of being no more than anyone else. They not only have a passion for creating incredible music but also for tackling tough topics in their song lyrics. The band does all of this while maintaining a positive message and creating forums for their fans to interact and even find help should they need it. 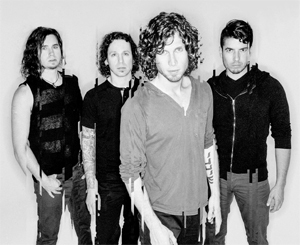 NOTHING MORE has been around for a while and they’ve continued to develop musically, spiritually, and philosophically along the way, and it really shows. The songs from their 2014 self-titled debut are powerful, at times progressive, and very well conceived. 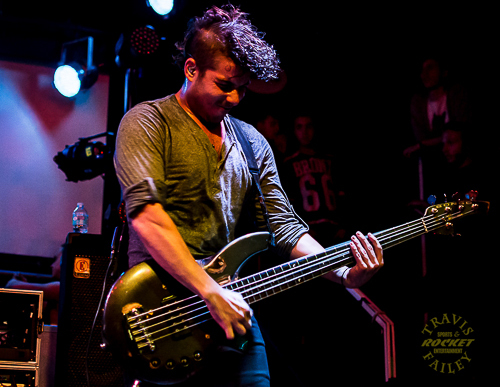 I had the opportunity to talk with NOTHING MORE bassist Daniel Oliver prior to the band’s performance in Pittsburgh. Here are some of his thoughts regarding NOTHING MORE and how the mindset and philosophy of the band have impacted his life. 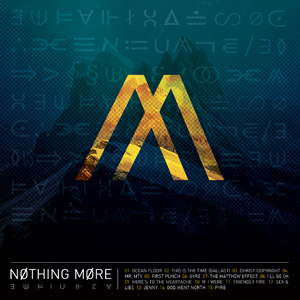 KNAC.COM: NOTHING MORE showed incredible determination and tenacity sticking together for 10 years with several Independent releases before being signed to the Eleven Seven Music Group in 2014. What was the biggest factor in keeping it going particularly with regards to the band’s passion for getting your insights and ideals across through the music? OLIVER: It was all birthed a decade ago when we started touring. In 2005, this is what we all decided we wanted to do. A few of the guys either didn’t go to college or decided to drop out to pursue music full-time, so it was a leap of faith if you will. Several of us had grown up in the Church, too. Initially, our minds were wrapped around a lot of those Christian ideals. But really, we felt in our hearts that we were supposed to do it. We went out, did it, and have never stopped. Every year has gotten better than the next. Without question, there certainly have been a ton of trials along the way, but everything we ever needed came our way. At the end of the day, we still loved what we were doing. We’re able to see that the mindset of faith and perseverance just like the balls and brains we put into keeping the band together actually worked. It kept us together and things did seem to have a way of manifesting out of thin air. We really came to understand the principle of the right timing. We didn’t start touring or making money immediately. It took really until now. We kept our lives stripped down and dedicated to the cause so we could go on the road. None of us had normal jobs. We started out when we were very young. None of us had made any big purchases, like a car, or had gotten married either. We’ve always stayed focused on the band and the music and over the years that’s what’s gotten us to this point. As for the depth in what we talk about, it’s just who we are and what we think about. As I mentioned, we grew up in the Church, though none of us would really call ourselves Christians now. That doesn’t change the fact that spirituality in general is extremely important to us. Where we are now is where our lives have led us and where we feel like we should be. There are a lot of messages in the music mostly because we feel as though we’ve lived it and we’ve seen certain things that others haven’t. People need encouragement to know that there truly is hope. Faith, whether tied to God or a specific creed, is a real thing. It’s a principle and not so much the hope that a deity favors me. It’s more physics than superstition. In a nutshell, that’s where we came from and the birthplace of NOTHING MORE, starting out at 18 to 21 years old. It’s pretty magical seeing everything manifest as a result of all of your efforts ten years later. KNAC.COM: Your 2014 self-titled release has tracks with incredibly complex rhythms, at times leaning toward progressive style music. The record also includes smooth, melodic breakdowns, so it never sounds busy. Is there a certain formula that you follow during the writing process? Are there members who take a lead role therein or is it a completely collaborative effort? OLIVER: It’s definitely a cohesive process. Every member writes and there are different strengths between all of us. The earlier material that the band doesn’t market anymore was far more progressive. As we’ve grown older and matured, we’ve focused more on the songwriting aspect as opposed to just making whatever the hell we wanted to make. That’s when the smoothing out really took place. You go into it as a progressive band trying really hard to write the best song that you’re capable of while conveying the best idea in the most cohesive way. It’s about painting the picture just how you want it. It didn’t strip the progressive out of it, but that’s what gives the music its sound. There were times when we’ve removed sections of songs because they were too busy. But there’ve also been occasions when songs have been progressive and no one seems to notice. There will be time signature changes from 3/4 to 4/4 and some songs are in 5 and nobody notices. Our hope is to be able to write in that fashion and still have badass songs at the end of the day. As far as member-to-member, our guitar player Mark is definitely our primary out-of-thin-air music writer. He’s a music generator even when we’re at a stopping point. In terms of our writing process, he’s usually the one who has an initial idea and then we all come together and jam on it. We’ll either write more music to it and/or change his original idea as a group. Once we have something that resembles a song, we quickly demo it and see what types of emotions it evokes. We work together to write the lyrics and the melody. Jonny is the strongest among us in terms of writing melodies. But, as for lyrics, that just varies from song to song as to who writes the majority of them. KNAC.COM: As mentioned, NOTHING MORE has been around for quite some time. Do you have plans to open up the catalog of material you’ve previously recorded prior to 2014’s re-release of Nothing More? OLIVER: We’ve talked about it. Basically, the two albums that are for sale are the only two with our current singer singing. He used to be our drummer. Jonny was the original drummer, he started singing in ’07, and then we recorded the last two records. We’ve talked about doing not necessarily a ‘greatest hits,’ but more of a ‘history of,’ picking the coolest songs out of all of that old stuff. I wasn’t in the band for the first album they did and I joined in early 2005. The only two original members are the singer and the guitarist and they were still in high school when NOTHING MORE formed. But the high school dream band stuck with it and now it’s doing something. So yeah, there might be a release at some point, but probably not of all of the material. KNAC.COM: After all of the years of hard work NOTHING MORE was signed to a guaranteed 5-album contract with Eleven Seven Music Group. Congratulations! How do you see NOTHING MORE evolving given such strong support from music industry insiders, fans, and the media alike? OLIVER: It’s kind of something that we’re all waiting to see, too. The coolest thing about the way things work now versus how they did before is that we finally have some money behind us. Our last record was self-produced using a kick-starter campaign and we literally did it in the house that we were all living in. Jonny headed up the production efforts. Each of us recorded our instruments independently in separate rooms and Jonny’s bedroom functioned as the master studio. But he really knocked it out of the park putting that one together. It doesn’t all come down to money, but that’s the one thing we never had. It’s not so much about paying talent to help. We’re just freer than we were before. In the past, there were so many things we had to do every day to keep the band running both as a band and a business, plus trying to keep our heads above water personally and financially. We all taught lessons and picked up odd jobs here and there. It’s going to be really cool to go into the next album and see how it comes out. The current release we recorded several years ago, so I’m really excited to see the growth between it and the new one. It’s going to be phenomenal. KNAC.COM: Clearly, the song “Jenny” holds a very special place in the hearts of this band and for vocalist Jonny Hawkins in particular. What was the inspiration behind the writing of the song? As well, please tell us about who will benefit from the #iknowJenny initiative. OLIVER: The literal story you hear in the song is about our singer and his sister. It’s still an ongoing battle with her and mental illness, being bipolar and facing drug issues as well. There’s a mix in there, too, with the story of Jonny’s mom battling cancer about seven years ago and how hard she fought the disease just to see her daughter get better. All the while, there’s an undertone of how the stress of his sister’s illness negatively affected his mom. All of us in writing “Jenny” have someone either directly in our lives or that we know and have dealt with very closely with mental illness. So, that was kind of the inspiration behind it all. The #iknowJenny campaign is really just an idea that came about to help end people’s negative misconceptions regarding mental illness. I mean; there’s no stigma when you tell someone that you have appendicitis. But the moment you tell someone you have a brain born illness or are bipolar, it seems to result in people making judgments or leaving a bad taste in people’s mouths. Mental illness is just like any other illness in that it’s not something that its sufferers can control. We’re offering the opportunity online for anyone to share stories openly and we, as a band comment back and talk. We get a lot of stories in Facebook messages, too. We hope to draw people out, comfort them, and help them find help. We’re doing a big donation right now; a pledge campaign that people can join online and we’re not just giving monies straight to charities. Those who participate can also come see us at various meet-and-greets and receive NOTHING MORE merchandise. So far, the initiative is going phenomenally well. We’re really happy to be a part of something positive and, though that’s clearly a song that’s very close to us personally, ultimately what we want to do is help others. KNAC.COM: NOTHING MORE has a very unique musical style that blends polyrhythms and heavy guitar riffs tempered with periods of melodic calm as found in the song “I’ll Be OK”. This is all well matched with unapologetic lyrics that tell stories from religion and greed run amuck to the perils of unchecked mental illness. It takes a lot of courage to broach these topics; yet NOTHING MORE does so in such a way so as to bring listeners in, making each of them feel like yet another included in the struggle rather than pointing fingers at those who may be at fault. Is this content initiative paramount to the band’s mission and, as such, will it continue with every new release? OLIVER: Well, none of it necessarily happened on purpose. It’s not as though we set out to be that way or write songs with unapologetic lyrics. Those are just the things we think about as a group and talk about. We spend so much time together. On the religious end, much of it has to do with things we’ve endured and witnessed firsthand. We certainly don’t pretend to have all of the answers. In terms of the community aspect, it’s more about being open with the questions we ask. There are so many things to which we don’t have the answers. We’ll never truly know whether certain things are greed driven, why political decisions are made, if people’s motivations are pure or influenced by some shady, backend deal, or ultimately who is or isn’t going to heaven. It’s all kind of the same thing. There are some really bad things in politics and religion. You can see it much more clearly once you understand yourself. I started understanding greed, political greed in particular, when I really understood how selfish I was and how I would compromise anything for certain things that I wanted. I don’t think that’s ever going to change for us. We’re really happy that it’s connecting with people, that others are thinking about these issues too, and whatever freedom others are finding in the music means the world to us. It’s not about ego; it’s just cool to open ourselves up like this and have it being reciprocated back in such a positive way. KNAC.COM: In a prior interview with KNAC.COM, Jonny mentioned some of his musical influences. Who are some of yours? OLIVER: Well, I’m definitely the least progressive musician in the band. Jonny, Mark, and Paul are masters of odd meters and things of that nature. I’m way more groove oriented, so I don’t play the pick or metal. I grew up listening to LED ZEPPELIN, THE BEATLES, STONE TEMPLE PILOTS and NO DOUBT. 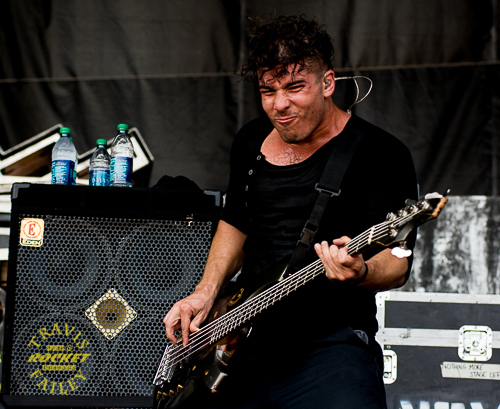 I’m a big fan of their bass player. But my biggest influences musically were members of my family. My dad’s a phenomenal musician, mainly electric guitar. But he plays lap-steel, piano, bass, and banjo really well. He can play pretty much anything stringed. My older brother became a bass player, too. He was probably my biggest inspiration. He was the one who sat me down and taught me the most. 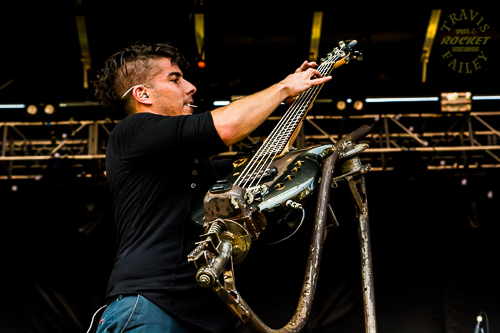 As far as tastes, the bands that we’re all into are bands like: THRICE, TOOL and NINE INCH NAILS. None of us really listen to much super progressive music. Oddly enough, we all grew up on DREAM THEATER. That’s as far as my progressive went. I loved VAN HALEN because my dad was a big VAN HALEN fan. Then, in my early high school years, one of my friends played me DREAM THEATER and I was like, ‘Whoa!’ It just blew my mind. They were the only progressive band I ever got into. As it turns out, when we did our first national tour, we were out with ADRENALINE MOB when Mike Portnoy was playing with them. [Laughing] So, as DREAM THEATER fans, we were all like, ‘Whoa! Mike Portnoy is right here, like every day!’ It was so cool! KNAC.COM: When did you first become aware of the philosophy of Alan Watts and what about it do you find the most meaningful or inspirational? OLIVER: Jonny discovered Alan Watts about four years ago and then the rest of us started listening to him because Jonny had raved about him so much. I stole all of Watts’ lectures from Jonny and have listened to them all so many times. The best way to put how we feel about Alan Watts is that he’s able to perfectly state what we’ve all felt for a long time about spirituality and existence in general. It’s sort of a ‘Wow’ effect. There may be something I’ve been thinking about for a long time, something that creates a discord in my head, I can’t quite figure out, or find a way to say. Then his words just say it and make total sense of it. It will fix that issue or completely explain that thought. I guess we all just fell in love with his way of thinking and Jonny had the idea of interspersing some clips of Alan Watts’ lectures through the record and, for some reason, it totally made sense. I’ve never been able to say why I feel like Watts’ words on the final song of the album, “Pyre”, summed up the record perfectly in this intellectual or spiritual clause if you will. But it just did. The coolest thing is how well he explains unity and how no matter what, we’re all kind of the same. Honestly, it’s such a big topic; I have a hard time talking about it without a specific path. Jonny would definitely answer that question better. He’s spent the most time combing through all of Alan Watts’ lectures from the ‘70s to be added into the music and all of the ones he chose are spot on. KNAC.COM: What’s something about NOTHING MORE either as a band or as individuals that your fans might not already know: hobbies, favorite movie franchises, etc.? OLIVER: There are two things we all do and completely agree on. One is The Walking Dead, which is stupid ‘cause it’s just a television show. Two, ritualistically before we go on every night, we put our hands together and cheer, ‘Bill Brasky on Three’. Bill Brasky was a fictional Saturday Night Live character from the ‘90s. He was a mythical man of greatness, the tales of whom were told by a group of drunken men during a series of skits on the late night show. [Laughing] Before we go on we invariably rattle off some Bill Brasky quotes like: ‘His foreskin covered Yankee Stadium,’ or ‘Bill Brasky’s feces was used as currency in Venezuela.’ We’ll throw out a few of the Bill Braskyisms and then we’ll go play. Though NOTHING MORE may head to the stage with a bit of laughter, once the lights go up it’s all business. As amazing as it is to hear NOTHING MORE through your home theater system, it’s no comparison to the power and stage presence of this band’s live show. The emotions that were felt by the band’s members when each song was written and recorded can easily be seen as they perform on stage. After hearing NOTHING MORE, discussing the band, its concept, and its mission with Daniel Oliver, then seeing NOTHING MORE perform live, the fact that the four members of this band have poured everything they have into it for the past eleven years couldn’t be more transparent. The recognition and support that they’re getting in response to all of that passion and hard work is very well deserved.